Hi folks, I’ve slightly updated my packing list for my meseta Camino in just over 20 days. The main additions are new trail shoes and a change in rain gear. I’ve changed my blister kit too. Check it out in the “Packing List” tab above. It is quite normal to change your packing list if you are one to return to the Camino frequently. There may be items that just don’t work for you or a better item might be available for sale. So I’m just going to post what I have scribbled down for my Camino in September. I weighed this at 7kg last week, the lightest pack I have brought so far. This is without water and snacks. If you have any questions about my packing list, please feel free to ask in the comments below. I want to post my packing list so you get an indication what I carry on my Caminos. This has been updated to include the items bought this weekend. I have made notes and included links to where I have purchased the items. Also, reviews from Youtube have been included which have helped me choose them. If you click on the link, an excel spreadsheet will open. Linda from SomewhereSlowly.com has posted her packing list if you are looking for kit and you are female. You can check that out here. Out with the Old – In with the New..
Shoes…they always need to be changed and I found that today was the best time to do it. My trusted pair of Jack Wolfskins that I bought in June last have served me well over two Caminos in September and May and the sole is well worn. Secondly, I have a voucher that is due to go out of date if not used! And lastly, I am walking two legs of the Lough Derg way next weekend. I would love some time to get used to them before then. I went to Great Outdoors in the morning. Town was full of tourists plus there was a rugby game on. I probably would have chosen a less busier time if I knew about that. Anyway, I arrived there and had a look at what they had in stock. Plenty of Meindl, Saloman, North Face, Merrell and Colombia. No Jack Wolfskin however. Hmm. I like the pair I own but I didn’t want to leave the store empty handed. I have previously worn Colombia and North Face and I liked them so I took a look at those. In the end, I chose a pair of Colombia Conspiracy Outdry. 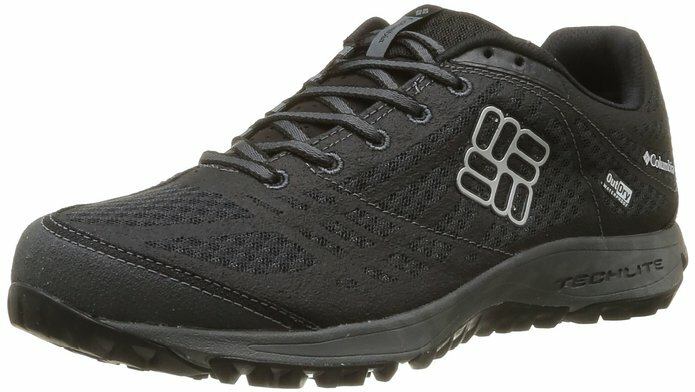 I’m looking for a lightweight shoe and one that dries quickly. I was told by the assistant that this is a great all round shoe. I’m happy with that. I’ll take it with me to Limerick and see how I get on over the two days. YouTube reviews are positive on the whole and the only concern I have is what would happen if it is hot. I’ll take them out tomorrow and see how I get on. So one of the downsides of postponing any trip is it gives you leeway to change or rejig what you are packing. Well, I’ve just gone and bought a rain jacket to add to my pack. So, out with the poncho and in with the rain jacket. The debate over rain gear on the camino (I’m not going to even start linking to these articles!) has been going on for years and for the last few years, I have swore by my poncho. This time I’m going to ditch it. I reckon the Marmot Precip is a good buy. It is breathable, lightweight and is pretty waterproof. All I need to do is give it a test run. I promise to leave my rest of my list as it is!! (although I said that before I bought the Precip!). I am the worst when it comes to gadgets however, so don’t be surprised if I bring more than my iPhone and charger. I’ve started to get in some kms over the last week. I try and get in 10km during the weekend and maybe 5km each working day. Not running. I don’t think I’ll ever run..not sure why? I hope to do a long distance walk (maybe 2) before I go..there are a few trails along the west coast I want to take in. I have also been quietly reading up on the Camino Portuguese for the future. One of my blog followers has just completed her Camino from Lisbon to Santiago and she gave some great tips that I will take note of. I don’t think I will start in Lisbon though, but Porto. You can read the blog here from day one. Another follower, Natasha Murtagh has started from Porto with her father and are both making their way to Santiago. You can read their story on natashamurtagh.wordpress.com. Natasha and her father have previously walked the French Way a number of years ago (I think it was 2011?) and wrote a very successful book called “Buen Camino!”.